Five weeks before admission, she had toothache without any dental procedure. Three weeks before admission, she developed fever,headache,neck pain and neck swelling. Two weeks before admission, she visited tertiary university hospital and neck CT was done. 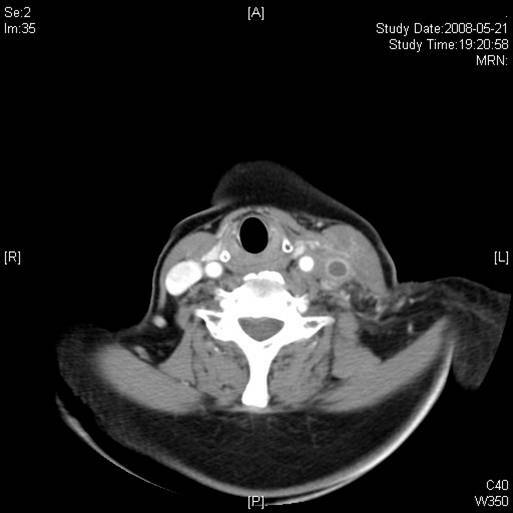 Myositis and diffuse thrombus of left internal jugular vein were diagnosed. The patient was prescribed antibiotics (vancomycin, augmentin and clindamycin). On the third hospital day, Streptococcus viridans was isolated on the blood which performed on the admission day. Q1. What would be the diagnosis ? Q2. What would be the most common cause of pathogen? - First report : In 1936, Lemierre with a publication of 20 cases, 18 of them died.
. Laboratory diasnosis of pathogen.
. Liver abscess and splenic abscess.